MatrixCare is fully prepared to guide providers toward success under the Patient-Driven Payment Model (PDPM)! Here you’ll find a wealth of related information and resources about the MatrixCare integrated platform for active care management—how we are addressing PDPM compliance within our technology, as well as how our solution is designed to help you maximize reimbursements under value-based care. We will continue to add resources to this page as they become available. Read our latest PDPM blog post! Download the PDPM White Paper! The countdown to the October 1, 2019, implementation date for PDPM is well underway! Learn how MatrixCare is part of Signature HealthCARE’s PDPM-preparedness plan. PDPM is fast approaching and there is a lot to do to ensure you’re prepared. 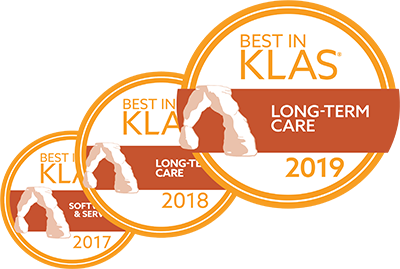 As the #1 Best in KLAS provider of technology to the long-term post-acute care industry, MatrixCare is providing education, resources, and of course, product enhancements to help our clients make the transition to this new payment model smoothly. Join our free 1-hour webinar to discover how MatrixCare users will be better equipped than their competitors to succeed under PDPM. Learn about the critical role documentation will play in accurate ICD-10-CM code assignment to meet the requirements of PDPM and maximize revenue under this value-based care model. In late July, CMS released the Final rule for FY 2019 which “replaces the existing case-mix classification methodology, the Resource Utilization Groups, Version IV (RUG-IV) model, with a revised case-mix methodology called the Patient-Driven Payment Model (PDPM) beginning on October 1, 2019”. Learn how PDPM differs from RUGS-IV and what you need to do in order to be ready for the proposed October 1, 2019 implementation date. How is MatrixCare preparing users for PDPM software changes and regulatory changes? MatrixCare is meeting regularly with advisory boards and focus groups, hosting webinars and training sessions, providing resources and information in our Client Community and will be presenting a multitude of informational and training sessions at our annual Directions User Conference in April. How can users be exposed to the software changes before the October release? MatrixCare plans to release the changes in a pre-release environment prior to the October release to prepare our client base for the changes to the MDS. Other enhancements that may be related to PDPM but are non-MDS facing will be released incrementally prior to October. If we have questions about PDPM, who do we direct our questions to at MatrixCare? MatrixCare has a priority email inbox where questions can be sent directly. Clients should send PDPM-related inquiries to PDPM@MatrixCare.com. This inbox will be monitored regularly, and questions will be routed to the appropriate MatrixCare expert to respond as appropriate. Questions that are not client-specific also will be added to the FAQs on our website at matrixcare.com/PDPM. How will MatrixCare support the increased criticality of daily skilled documentation? Standardization of the nursing assessment and skilled documentation will be aligned with the required documentation of a Medicare Skilled stay utilizing evidenced-based guidelines and research to guide nurses on the appropriate action to take when patient data is outside the normal or set parameters. These standardized nursing assessment and documentation forms will capture relevant data, allowing nurses to create patient centered care plans and optimize patient outcomes by providing meaningful data. The forms will be customizable with the ability to turn on and off questions related to the type of assessment/documentation being completed and/or related to the patient’s diagnoses and will also include an evaluation of patient/family educational needs and barriers to learning. Our assessment and documentation forms will continue to evolve as our clients progress through PDPM and the clinical complexity of their patients changes. In addition, MatrixCare will be adding scheduling capability to existing Observations and Events and Clinical Decision Support to assist our clients with managing compliance and completion of documentation. How will MatrixCare support Discharge Planning? New functionality is being developed to assist the interdisciplinary team in planning for discharges with robust planning functionality that can be initiated on Day 1 of the Admission; including discharge goals and outcomes, discharge needs and education, community resources and DME, follow-up appointments, etc. The discharge summary report will be available to residents who discharge to home or are transferred to another facility. How will MatrixCare support monitoring of functional abilities (improvement and declines) over time? How will MatrixCare accurately track the progress of a patient and display trends throughout their stay? Function score for patient classification under PDPM is now calculated using data from Section GG of the MDS 3.0 rather than Section G. The functional score for the PT and OT components is calculated based on ten Section GG items which have shown to be highly predictive of PT and OT costs per day. The required observation window for functional abilities is three days on the five day (admission), three days at discharge (end of stay) and will be three days for the IPA. Clients who are actively documenting daily will have an easier time monitoring trends in abilities over time. MatrixCare allows clients to schedule functional abilities every shift or daily. MatrixCare’s Point of Care solutions enable users to capture the Section GG data, which is then reportable. How will MatrixCare support Restorative Nursing programs? Restorative Nursing Programs can be scheduled through MatrixCare’s Point of Care solutions. Restorative Nursing Programs can be created and individualized in Point of Care to ensure that, although running concurrent with therapy, the nursing restorative programs have separate goals (required for reimbursement). MatrixCare Point of Care can be captured on mobile devices and in real-time (CareAssist only). MatrixCare makes it easy to record time spent on Restorative Nursing, the details of the program, participation and outcomes measures. MatrixCare is also working to develop new functionality to alert users when residents are not meeting the minimum requirements to trigger. How will MatrixCare help clients adjust to the newly proposed PPS schedules? The new PPS schedule will auto-generate and be available using the same means as the PPS schedule. There will be a PPS Due report and the schedule will be displayed in the Assessments Due area of the MDS, as well as on the facility and resident calendars and in the PPS Due widget. There will also be a special function to schedule the IPA that must be done during the first seven days of October 2019. How will the system handle "return to provider" codes as the primary reason for the SNF stay under section I0020B? Validations will be in place for any code entered in I0020B. The validation will be based on the list of Diagnosis codes provided by CMS. Will MatrixCare have a simulator tool available to compare RUGS to PDPM? Yes, the MatrixCare RUGS to PDPM Simulator Report is in development. It has been reviewed with clients and will be released in Spring 2019. What solutions are planned for CMI state reporting after September 30, 2020? We have contacted all PPS states. At this time, no state has provided their plan for 2020. Once the information is available we will respond accordingly. Will the MDS highlight the areas that affect PDPM billing, such as it does now for the RUGS? Can we have this functionality prior to October 1st? We will identify the MDS question used in the PDPM calculation. The current RUGS identifiers will be maintained until CMS ends support for RUGS. How will MatrixCare support ICD10 coding (both look-up and hierarchy)? Under PDPM, clients will be required to report the patient’s primary diagnosis on the MDS for the SNF stay. Each primary diagnosis is mapped to one of ten PDPM clinical categories, representing groups of similar diagnostic codes, which is then used as part of the patient’s classification under the PT, OT, and SLP. has, which can factor into the SLP comorbidities that are part of classifying patients under the SLP component, as well as the NTA comorbidity score that is used to classify patients under the NTA component. MatrixCare diagnosis code search will return a list of these more-specific codes and will identify the clinical categories. Codes identified on the face sheet will also pre-fill in the MDS. Will I0800 and I0020 auto-populate the face sheet diagnosis list? The “Select Diagnosis” functionality is being enhanced to identify the codes from the resident record that are used in the PDPM calculation. If a diagnosis code has been identified on the face sheet as the Primary Clinical Category, this code will pre-fill I0020B. Will I0020 automatically carry over to the UB-04 as a primary diagnosis? The face sheet will continue to allow identification of the Primary diagnosis code. We are adding functionality to identify the Primary Clinical Category diagnosis code to be used in the PDPM calculation. These diagnosis codes may be the same or they may all be different. CMS has identified more than 24,000 codes as “return to provider,” which means they cannot be used as the Primary Clinical Category. Will I0800 A-J carry over to the UB-04 in order of sequence? There is no plan to map the diagnosis codes from I8000 to the UB-04. On the face sheet in the diagnostic code section you can sequence both clinically and for accounts receivable. You can configure payers to populate diagnostic codes on claims directly from the clinical sequencing or from the account receivable page if it should be different. If a Med A patient is receiving skilled care and the facility picks an ICD10 code that does not crosswalk to an approved reimbursable code, will the user be alerted? They will be notified when they try and identify a diagnosis code as the Primary Clinical Category on the face sheet and on the MDS. Are there plans for a pre-admission calculator? Can we predict how reimbursement will look under PDPM prior to admission? MatrixCare is developing an Intake Management solution that will allow clients to pre-screen admissions by reviewing history, cost of medications, and more. This software is in development today and will continue to evolve. MatrixCare is also working with our analytics platform to enhance reports that will allow you to predict and drill into reimbursement. What patient-level reporting will exist in 2019 prior to October 1st to determine RUG-IV versus PDPM rates? The simulator tool will be incorporated into MatrixCare as a report. It will allow comparison of RUGs and PDPM rates. How will MatrixCare MyAnalytics support PDPM? Will we be able to monitor functional outcomes improvements? The analytics team is developing functionality that will allow a deeper dive into the PDPM calculation. Will MDS data still flow seamlessly to Revenue Cycle Management and Claims Management? Yes! Absolutely. The MDS 5-day assessments and IPA (interim payment assessments) under PDPM will continue to automatically trigger the charge calculator and the HIPPS code will pull to claims. How will MatrixCare indicate when an MDS assessment is incomplete? Instead of using the AAA score, we will be using the PDPM ZZZ score. Will MatrixCare continue to automatically update and calculate the PDPM rates on an annual basis with the CMS data? Yes, to save you time, the rates will all be calculated for you. There are a lot of nuances with declining reimbursement rates and different factors like the new 3-day break-in-stay rule. Will these be built into MatrixCare Revenue Cycle Management? Yes! The charge calculator will handle all the reimbursement rate calculations and declining rates. We will also handle the calculations when an AIDS diagnosis (B20) is present (reimbursement rate increases of 118%). Will there be new summaries on the reports to indicate the days and reimbursement rate for each PDPM score? Yes, we are updating existing reports and even building some new PDPM reports to allow you maximum visibility into how PDPM is impacting your business. How is MatrixCare engaging therapy vendor partners and what data will be pushed to them beyond the MDS data? Late Loss ADLs? GG? Orders? We continue to meet regularly with our vendor partners to plan and develop needed changes. As our partners request data from us, we will look to include this as part of our regular development lifecycle. We continue to prioritize PDPM as our highest priority. If a scrubber alerts to a change, how is the MDS nurse alerted to make the change? Our partners will supply a report with the results of their MDS analysis. Do you have questions about how MatrixCare is helping prepare you for PDPM? CMS has published a PDPM site that includes a variety of educational and training resources to assist stakeholders in preparing for PDPM implementation including PDPM Fact Sheets, FAQs, Training Presentations, and PDPM Resources. Page 34, Section 14: Transition Policy and Medicaid Issues2: How will I get a PDPM payment code to bill starting October 1, 2019? CMS has posted a new DRAFT version of the 2019 MDS item sets (v1.17.0). This version is scheduled to become effective October 1, 2019. There are a large number of changes that are outlined for what is coming. First look at the Interim Payment (IPA) and Optional State Assessment (OSA) forms. Question I0020, answer value 14, Other Medical Condition has been deleted and the associated diagnosis code I0020A has also been deleted, replaced by I0020B. Visit CMS website to download MDS 3.0 Item Sets v1.17.0 (DRAFT) for October 1, 2019 Release. MatrixCare is proud to partner with American Association of Nurse Assessment Coordinators (AANAC) in providing you easy access to their publicly available PDPM content. Founded in 1999, AANAC has earned the reputation as the premier resource and network for long-term care professionals involved in the RAI/MDS process. AANAC is known for their excellent resources in all aspects of information regarding long-term care resident assessment and care planning. Please visit AANAC to learn more.